Synopsis: In 2007, Led Zeppelin reformed for a special concert to honour Ahmet Ertegun, the Atlantic Records founder who was instrumental in their colossal worldwide success. This is the spectacular film of that now historic performance. Hail Hail! Rock and roll! They are the champions, my friends! First, an undeniable fact. When it was announced that Led Zeppelin would reform (With 'Chip off the old block' son Jason deputizing for his late father, John Bonham) for a one off show, expectations were that demand for tickets would be high. Just how high staggered even the skeptics. 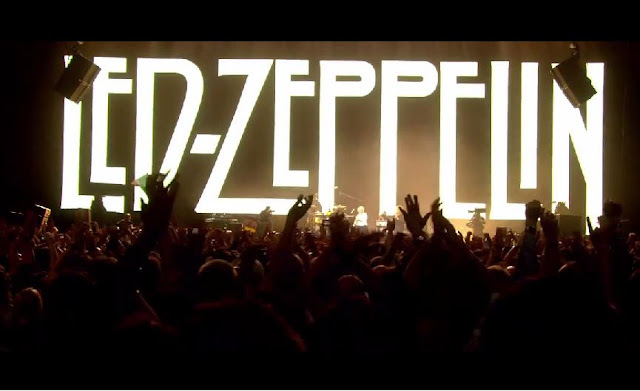 Over 20 million fans vied for this once in a lifetime opportunity to see the Zep perform for what may be the last time. The caveat was that the show was restricted to just 18,000. Those lucky few were selected by a worldwide lottery to determine who would be turning up on the night to witness history in the making. Presumably, none of the 20 million had guns to their collective heads, so you could posit the theory that interest in this group has not really abated since they last bestrode the earth as rock monsters, obliterating all in their path! Possibly only Pink Floyd getting back together might recreate the same feverish level of devotion? Come December 2007, those very lucky few from around the word got their opportunity to witness one of the most amazing 'comeback' performances in rock 'n roll history. Judging by Robert Plant's comments since that historic date, his steadfast refusal to trade on former glories (And reunite for what would be obscenely large amounts of filthy lucre) is perhaps both understandable, but commendable at the same time. Thank the gods then, they made the fortuitous decision to take a couple of film cameras along to record this for all posterity. Now, the other 19,982,000 (Amongst the other odd fan or two) get to see what happened on that night. Oh, what a night, late December in 63... Oops, wrong song, wrong year! What singular word can describe this experience? What word can accurately convey the many emotions that you feel when watching this event? The answer is the one that feels right for you. For me, its this one. Magic. Sheer magic. The joy of watching these masters creating musical magic is something to behold. This quartet of men (Guitarist Jimmy Page, Vocalist Robert Plant, Bass Guitarist/Keyboards John Paul Jones, Drummer Jason Bonham) operate on a level above most mortals. The other key word that's pertinent here is chemistry. Like any relationship, chemistry is a vital component that can't be denied. If you don't have it, well, the road is littered with many who've fallen by the wayside. Some combinations just work better with the participants who are in sync with each other. These legends have a lethal intensity when they work together, recreating the music that has being such a major part of their lives. It cannot be faked. It is a visceral, raw, magisterial, unique creation that is the sum of its equally important parts. Take just one component out of the equation, and it becomes the proverbial three legged dog, a mongrel that is hard to warm to for most. For two and a half hours, Page, Plant, Jones & Bonham remind us of their electrifying talents, blazing away song after song, displaying immense ability with the tools at their disposal, guitars, drums, keyboards, vocals, all meshing to form a sound like no other - the towering colossus that is LED ZEPPELIN. From surprise opener "Good Times, Bad Times" to second encore "Rock and Roll" - and 14 songs inbetween, you (if you haven't already been converted previously - you should of! But, I'll forgive you for your oversight - if you pledge to convert to the cult of Led Zep :) get to witness 16 reasons why not just the west, but also, how the world was won over with the sheer level of brilliance these magnificent musicians created back in the 1970s. One of the key reasons why this gig was so successful comes down to one detail that might be overlooked initially, but when you watch it for a second time, its readily apparent - is the interaction of the 3 main members who are constantly turning their backs on the audience to face Jason Bonham, who very clearly, is having the most important gig of his life. For the record, I don't think he will ever get that kind of chance again. At the very least though, he, like us, can relive it anytime by replaying the concert (Insert your format of choice here!) whenever the mood takes. He feeds off them, they are feeding off him, they all are feeding off the audience. I'd say that's a 'win-win' for all involved - even us observing from a future time and space. At this time of writing, there is (In New Zealand) at least more than 10 cinemas throughout the country with sessions still upcoming. My advice? Duh! If you've got this far into my review, then there is only one appropriate answer! Same for anyone overseas reading this - go to this link for when its screening in your neck of the woods: Led Zeppelin: Celebration day listings. This is, without doubt, an amazing experience that really is best benefited by the largest screen possible - your local cinema. Otherwise, keep some money aside when November 19th rolls around - and buy the Blu-Ray (Not the DVD - upgrade if you have to. Trust me, it will be well worth your while! ).